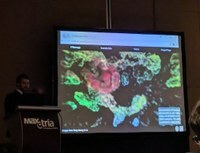 Marcus Fantham, a PhD student at Cambridge presented his 3D data sharing software tool, published in Nature Photonics last year, at a major conference in Germany and Singapore to the microscopy academic community. He now also has 2 recent Nature Communications papers! "My software tool FPBioimage, published in Nature Photonics last year, continues to grow in popularity as I add more features to it. The latest of these is a plugin for a popular image analysis program, ImageJ, which allows researchers to upload their 3D data for sharing or publishing with just one click. To announce this development to the microscopy community, I gave talks both at the International Conference On Nanoscopy (ICON 2018) in Bielefeld, and at Focus On Microscopy (FOM 2018) in Singapore." Lautenschläger, Janin, Amberley D. Stephens, Giuliana Fusco, Florian Ströhl, Nathan Curry, Maria Zacharopoulou, Claire H. Michel, Romain Laine, Nadezhda Nespovitaya, Marcus Fantham, et al. "C-terminal calcium binding of α-synuclein modulates synaptic vesicle interaction." Nature communications 9, no. 1 (2018): 712. http://doi.org/10.1038/s41467-018-03111-4 . "To find the ideal MOF, we had to analyse a database of over 3000 MOFs with 40 parameters for each entry. To address this big data problem, I wrote a web-based graphing tool which is able to present up to 6 dimensions at once, utilising spatial dimensions, time, colour and size. This tool is presented alongside the paper, and can now be used by the MOF community for the discovery of MOFs for other applications." Many congratulations Marcus on a great start to your academic career!